"Here's what I do with the wonderful zucchini in summer. Don't be daunted by the list of ingredients. It's long because of the various added spices, which give the wraps a wonderful flavor. The actual procedure is quite simple." In a medium size wok or saute pan, heat the oil over medium-high heat. Add mustard and cumin seeds. As they begin to pop, lower the heat and add the onion and ginger. Saute until onions are soft and light pink in color. Add the shredded zucchini, increase the heat slightly. Stir frequently until the zucchini gets soft and well-cooked, approximately 5 to 10 minutes. Stir in the chili powder, pepper, clove, cinnamon and salt. Warm the tortillas and place the tortillas on a flat surface. Place 1/4 of the zucchini filling in the center of each tortilla. Roll up each tortilla and tie it closed with a chive. 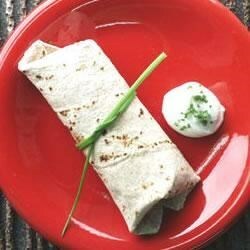 You can serve the wrap with a dollop of sour cream on the side, it makes for a well rounded wrap! The clove taste was pretty weird with the zucchini. Some people would probably like this, but it wasn't to my taste. Didn't like this one, sorry. The ground cloves were too overbearing so toned them down a bit... didn't help. This recipe was so easy to make and so VERY tasty! I will be making this over and over again! Thank you, Rani, for submitting this recipe for us.